I know it’s a cliché but nothing says summer like a warm, windless night in Chumash Arena at the Paso Robles Fairgrounds. Throw in some party rock, cute cowgirls (and cowboys), plenty of adult beverages and your recipe is complete. Sure, the fair can get a bit tired and rote with most of the headliners recycling through the arena every three or four years. And a night out in fair town ain’t cheap either, especially if you’re hungry and thirsty. But sometimes the planets align for a magical evening of short-sleeves, cool people and music that make the familiar trek north along the 101 totally worthwhile. For me, the recent Train show on the main grandstand was one of those occasions. As I’m sure Zac Brown Band and Florida-Georgia Line were for my country brethren too. A festive, not overcrowded vibe was in the air with the venue about 2/3 full. Elbow room is always essential whether carrying multiple beers or jockeying for position on the dirt floor. Security there is always friendly and never overbearing, which contributes to a mildly chaotic but fun, playful atmosphere. A more refined Pozo, if you will. Dude, it’s a rock and roll show. That’s what you want. 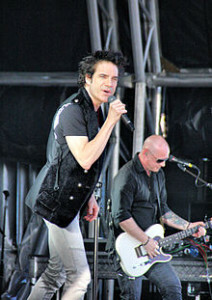 After a tight, efficient 55-minute set by the talented Jacob Dylan and his Wallflowers band, Train and its frontman Pat Monahan launched into their first big classic, ‘Calling All Angels.’ Everyone was standing and swaying immediately, always a good sign of things to come. Part of that was due to the rap/disco music playing in between band sets, a stroke of genius that got everyone grooving before the headliner even hit the stage. In between, the guys brought up dozens of women dancers and even a few couples before their rendition of ‘Marry Me.’ All the while, Monahan snapped selfies and playfully interacted with the crowd while lead guitarist Jimmy Stafford laid down the musical guts on stage, which climaxed with ‘Hey, Soul Sister’ and ‘Drive-By’, arguably their two best tunes. You know it’s a confident band at ease with themselves when they jam on a surprising cover of ‘Ramble On’ by Zeppelin, then end the show with a rousing version of Aerosmith’s ‘Dream On.’ Overall, it was a solid 90-minute performance of controlled creativity and spontaneity, whatever the heck that means. A dreamy night in balmy Paso? It must be late July at the California Mid-State Fair.